After the Normans arrived in Chester in about 1069, Peter de Leia, the Bishop of Litchfield, transferred his see from Litchfield to Chester. In 1075, he began to construct a cathedral on the site of a 10th-century wooden church. Work proceeded rapidly at first but in 1082 the Bishop died. His successor, Robert de Limesey, lacked enthusiasm for continuing with the project. He considered Chester to be an ill-chosen site for such an important ecclesiastical establishment, possibly due to its proximity to the Welsh border and the inherent dangers associated with that, and so moved his see to Coventry. However, around 1190, work on the abandoned church was resumed and St John's was finally completed in the late 13th century. In 1348, it was described as a "comely and sumptuous fabric constructed of stone and wood of great breadth and length, but the same being ancient and decayed, repair was necessary or it would fall into irrevocable ruin". And it very nearly did! The central tower collapsed in 1468 and again in 1572. The west tower collapsed in 1574 and destroyed four bays of the Norman nave. 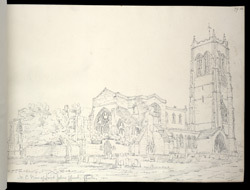 Even after Buckler drew his sketch here, the church still couldn't manage to remain intact - the rebuilt west tower fell again on Good Friday, 1881!